5 miles west of Dudley in the UK, Himley Hall sits on the border of South Staffordshire and is an unlikely venue for a LEGO exhibition. 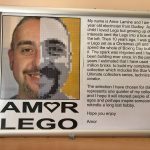 But, a local Electrician and LEGO enthusiast, Amor Lamine, has put some of his own personal collection on display for the summer. And I must say, ‘WOW, what a collection it is!’. My wife had alerted me to the exhibition a few weeks ago after features in my local press, so as an avid collector and builder of LEGO myself I thought it would be a nice place to visit on my recent birthday. 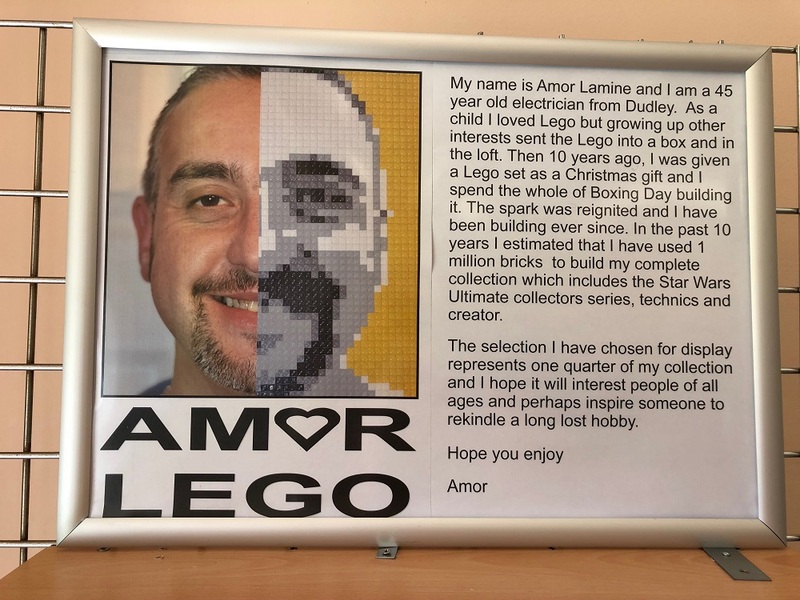 As you approach via the tea rooms, you are greeted by Amor smiling at you from his LEGO brick picture and a rather ominous Darth Maul scowling beneath. Camera in hand I started clicking away and marvelling at the rare items in his display. I could see that Amor has got a real passion for LEGO and Star Wars, so I after returned home I decided to track him down to try and speak to him. Facebook has its faults, but on this occasion it turned up trumps and Amor, accompanied by his wife Jane, met with me on Saturday at his own exhibition to discuss LEGO and Star Wars. Hi Amor, it’s great to finally meet you! Hi Steve, thank you for asking me to come along and join you here for an interview. I had LEGO as a child, as most of us did, but with the reinvention of LEGO away from the basic sets we were used to it has developed into something for all ages and can be very complex. I am very mechanically minded due to the nature of my work, so it is very similar in a way. You can go from one brick to something magical in the matter of an hour. So what got the adult Amor back to grips with LEGO? It was a Christmas day morning just over 10 years ago! Santa had left me a parcel under the tree and when I picked it up I just could not tell what it was. I shook it and although it sounded familiar, I was still not convinced of what it was. The wrapping paper was promptly torn off and there was a LEGO Set 75905 Ultimate Collector Series (UCS) TIE Fighter in my hands. Christmas day is a family day for us, so I had to wait until the following day to start my build. 8 hours or so later I stood back from the table and there was my very first LEGO build as an adult. There was a sense of pride and achievement, but the biggest thing was I had enjoyed it so much. The UK Boxing Day sales had started, so I went online and found Argos had a sale on and it included LEGO sets. I decided to purchase the Pick-up Truck kit and raced to the store to collect it. That New Year’s Eve I built it all in one sitting before going out to party with friends and family, and since then it has become my major hobby. How have you amassed so many sets in such a short space of time? I am lucky as I earn a good living from my work. This allows me to buy things that are out of reach of some people. I am a very tactile person and I like to have something physical in my hand from the money I spend. Over the recent years, I have spent a lot of time trawling specialist LEGO sites, Facebook LEGO groups and auction sites to accumulate my collection. Some bargains are there to be had, but some kits I have had to make a substantial investment to obtain. What was the reason for displaying your collection? I wanted to share what I have with anyone who has the same interest like yourself. I love LEGOLAND, but the sets on display are the pinnacle of what you can achieve with LEGO. Although amazing to marvel at, you can’t recreate that in your own home. With this display, children and adults can come here, look at the collection and then go away and buy what they have seen. I think it is important that people can get to see the final product of what is inside the boxes of bricks that they buy in the shops. I was really pleased to see that admission is free, but must admit, I would have willingly paid to visit. Dudley Council who own Himley Hall have a no charge policy for all museums and exhibits, which means it is open to all and everyone. What help have you had to get this exhibition off the ground? A lot! My wife Jane has been brilliant in helping me with her contacts to secure the venue. She is really patient and puts up with my collecting and building. John Billingham and Alan Harvey, (Exhibition Assistants) from Dudley Council look after the exhibition for me during the week and Tracy Reece, who is the manager here at Himley Hall. Without these people I could not have done this. I can’t thank them enough for all their help and effort. Are you going to be displaying more items? Yes, definitely. I have more Star Wars sets and other sets at home, like the house and Kwik-E Mart from the Simpsons cartoon show. The display will only get bigger over the coming weeks. John is currently trying desperately to secure more display cabinets to keep up with me and my building regime at home. Do you have any special events planned for the exhibition? We have a live build scheduled for 21st/22nd July 2018. I am not 100% sure as to what I am going to build, but I’ll be here to meet everyone as I build another creation to add to the display. 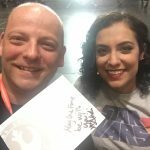 I’d love to see as many people down here as possible to get involved, maybe Jedi News would like to join us? Now that’s an invite I’m not going to refuse! I’ve just marked my diary with the date. When does your exhibition close? At the moment we are open all summer and close on Saturday 22nd September 2018. Due to the success of the exhibition, we are in negotiations to extend our stay here until early November to encompass October half term and the annual bonfire and fireworks display held here. I must say this piece of cake that your wife Jane has just put in front of me looks amazing. With the LEGO brick on the cake, it shows that the council and Himley Hall are behind you in this. Very much so, the LEGO themed cake has become a big seller apparently. There are other exhibitions on here currently from local artists which and people who have been into there and have decided to stay for a coffee or tea end up staying longer after visiting the exhibitions and vice versa. It’s great to see people who don’t even have a passion for LEGO stop by and be amazed by what they see. 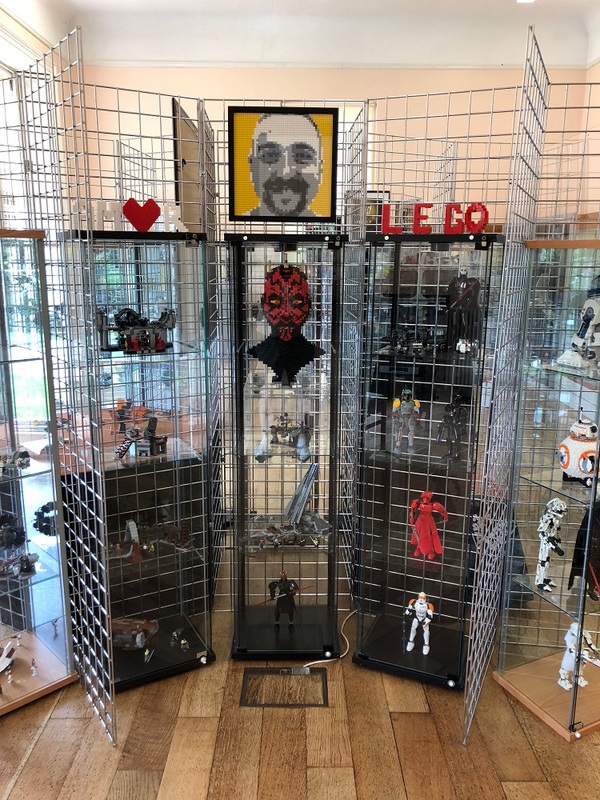 Well Amor, the team at Jedi News would like to thank you your time and wish you every success with your exhibition and I look forward to meeting up with you for the live build in July! I’m really looking forward to that event and it will be great to have Jedi News here with me. It’s been a pleasure Steve and thank you to everyone at Jedi News. It’s nice to have been able to talk to someone with the same interests and enthusiasm for what I do. As you can see from the pictures, the exhibition is fantastic for all ages and fans of LEGO. Amor has a real passion for what he does and it is rare for someone to have the opportunity to share that with so many people in this way. There is a visitor’s book, so please take time to leave Amor a message about his collection and let him know Jedi News sent you along. Himley Hall is set in a beautiful location, with outstanding gardens landscaped by the celebrated Capability Brown, country walks along the side of the lake, an outdoor café, a 9 hole golf course as well as the Hall with its tea rooms and exhibitions, is well worth a visit. For more information about Himley Hall and what has on offer please visit their website.